TEMPE, Ariz. — Kelsey Moos (15 points, 12 rebounds) and Joy Burke (14 points, 10 rebounds) both had double-doubles to lead the No. 24 Arizona State women’s basketball team to a 63-60 win over No. 20 Syracuse on Monday. Sophie Brunner added four points, 11 rebounds and three blocks for the Sun Devils (11-1), who won their 10th consecutive game. It was also the 313th career win at ASU for head coach Charli Turner Thorne, who is now No. 2 all-time among Pac-12 coaches in victories. Also coming up big for the Sun Devils, who trailed by as many as eight in the first half, were Promise Amukamara (eight points, four steals) and Adrianne Thomas (seven points). Syracuse (11-2), whose only previous loss was at current No. 22 Iowa (97-91), was led by the combination of Brianna Butler (25 points) and Brittney Sykes (13 points), who combined for 38 points overall but only 11 in the second half. Butler scored seven straight points during a 10-0 run that gave Syracuse a 37-29 lead with 1:37 left in the half. The Sun Devils would score the next four points to cut the Orange’s lead to 37-33 at the break. A layup by Moos, which gave ASU a 55-54 lead, its first of the second half, started a flurry of lead changes over the final six minutes. A Sykes layup put the Orange ahead 60-59 with 1:59 remaining in the game, but a putback by Moos on the following possession gave the Sun Devils a 61-60 lead. Following two missed free throws from freshman forward Briana Day, the Sun Devils could not get up a shot in time and gave the ball back to the Orange with 33.4 seconds remaining. Sykes drove the lane trying to draw a foul, but instead had her shot go out of bounds off ASU, giving Syracuse the ball with 14.5 seconds remaining. After Sykes drove the lane under heavy pressure, it was Thomas who came up big for the Sun Devils, taking a charge and then calmly sinking two free throws to extend ASU’s advantage to 63-60 with 7.6 seconds remaining. Rachel Coffey drove the length of the court, but her desperation 3-pointer came up short and the Sun Devils were able to hold on for the victory. 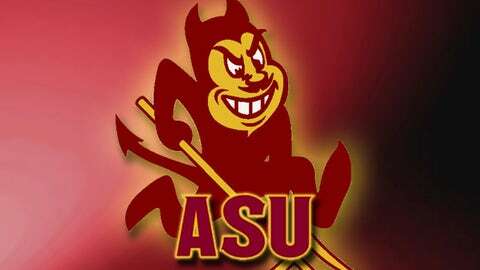 ASU joins No. 4 Stanford (11-1) and No. 12 Colorado (10-1) as the only one-loss teams in the Pac-12 with league play beginning this week.